I would presume that most people working in museums inherently believe that preserving history is important – I would certainly hope so at least. And while preservation can be a monumental task all on its own, it’s really only half of the challenge. The real value comes in being able to share this history – to make it accessible in some ways. When we think of museums, the first method of achieving this that usually comes to mind is through exhibits. Visitors can see – and in some cases touch – real artefacts and are provided with additional background, context and perspectives to better understand the history we present. This might be considered the ideal approach and while over 350,000 people visit our museum’s exhibits each year, we also know that many people around the world with some link with our Regiment, may never get that opportunity. With that in mind, we’ve tried to digitize much of our collection and make it available online, here on our website, on our Flickr site (over 10,000 photos currently), Facebook, Instagram, and Twitter. And we’ve also made our collection catalogue available online as well with images and descriptions of almost 2,000 objects entered to date. All of this takes an incredible amount of work and coordination, and most of our volunteer team have contributed to this effort in some way or another. But I’d be lying if I didn’t admit to occasionally wondering if anyone actually accesses any of this information, and if all this work is worth it. The stats tell us that our Flickr site has had over 1,000,000 views and our website gets about 80,000 page views annually which is very exciting but still somewhat impersonal. Occasionally though we get comments on our website about how the information helped them connect with a relative or letting us know they have more information to share – even objects to donate, and those always seem to make our efforts worthwhile. “My name is Liz Grogan and I am the granddaughter of Sgt. J. Lutton 6164. A couple of weeks ago, I was sitting with my 95 year old mom, John’s middle and only surviving daughter, Kathleen ( Kae) Smith who was browsing through a book I was reading for my book club called “The War that Ended Peace, The Road to 1914” by Margaret MacMillan. I had researched his name prior to Remembrance Day on other occasions , but I had not seen this letter before! So Mom and I sat together and I read the letter out loud as mom watched the screen. I had not scrolled through to see how long it was, so my thanks to WO Emily Kenny for her hard work! I can’t express how magical this moment was, that I will never forget. We laughed, we cried and we were simply in awe of having this amazing opportunity to have a personal peek at the life and love between mom’s future mom and dad and my future grandmother and grandfather. When I read this email, I couldn’t help but smile and was clearly reminded that our efforts are definitely worthwhile! Of course Liz was interested in how we came to have the letter. In June a stamp collector in Nova Scotia contacted us because he had this letter in his collection and had found online that we perpetuated the 198th Battalion, Canadian Expeditionary Force. We quickly accepted his offer and the letter was soon in our collection. WO Kenny just happened to be directing staff on a music course at CFB Borden for the summer and offered to transcribe the letter in her spare time so we could put it online. The letter is long and rather rambling, and proper punctuation was not Sgt Lutton’s strong point but she soon had it done and we posted it to our website. While this was happening we also researched Sgt Lutton’s life and service. While training in England he contacted meningitis and was hospitalized for 6 months before being found unfit for overseas service and returned to Canada where he was hospitalized for another three months. Though he never made it to the trenches of France or Belgium, his story does illustrate the other dangers many soldiers faced from diseases and poor health conditions they faced just getting to the front. Lutton was lucky enough to recover from his meningitis and married Annie in 1919. He died in 1948 and is buried in Park Lawn Cemetery. We’re very thankful that Liz took the time to share their experience and to send us the delightful family photo below of Annie and John. Once again, the Regiment has worked with its fellow regiments, The Governor General’s Horse Guards (GGHG) and The Royal Regiment of Canada to honour the 3rd Battalion (Toronto Regiment), Canadian Expeditionary Force, which each unit perpetuates. On May 30th, the GGHG dedicated new markers in the town of Courcelette to commemorate the battle honours of Somme 1916, Pozieres, Flers-Courcelette and Ancre Heights, all costly battles for the 3rd Battalion and the 4th Canadian Mounted Rifles, which the GGHG also perpetuate. Costs for the memorials are shared between the three regiments. Previous markers commemorate St. Julien and Passchendaele, and a marker for Mount Sorrel was dedicated in June. Major Adam Saunders is a Queen’s Own Rifles officer currently posted to 32 Brigade Headquarters. 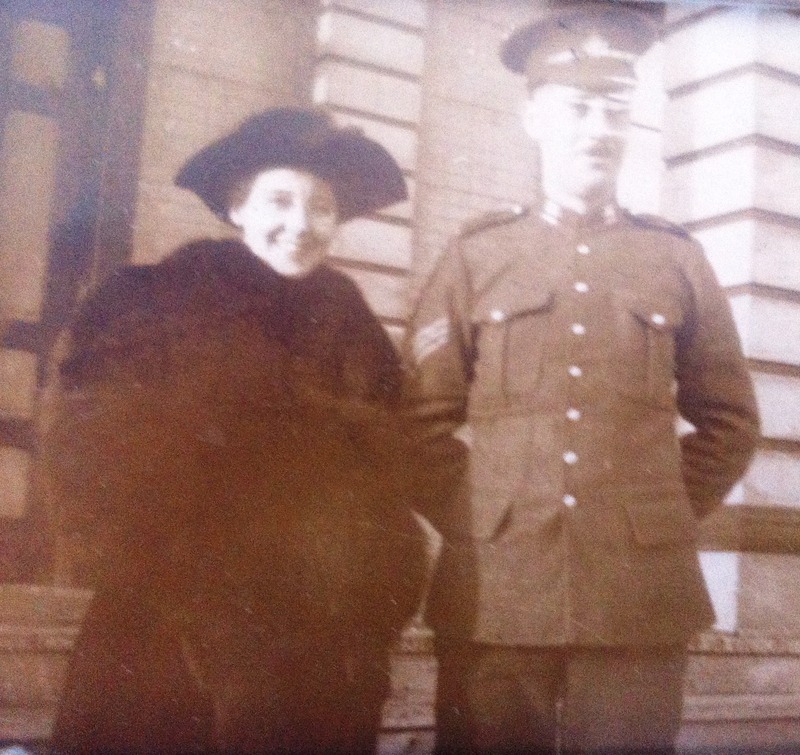 His grandfather Thomas Cully, served in D Company, 3rd Toronto Battalion, Canadian Expeditionary Force. This article was written by Adam while in Belgium. Most of the participants eyes were watering, as the scene at Vancouver Corner was an emotional one. The tears were from being lost in another time while listening to Belgian school children signing songs of peace and remembrance. One hundred years earlier the tears at this place were a result of the effects of the first industrial scale gas attack in history. Here we stood at the Vancouver Corner Memorial at 5 pm on April 22nd, 2015, lost in the nightmarish reflections of 5 pm on the 22nd of April 1915 when the German Army unleashed chlorine gas against the French portion of the Ypres salient. Canadians immediately felt the effects of the ensuing attack by the German ground troops. The French line had broken and the Canadian flank was ripped open. Today school children, diplomats, history books, photos, the land itself all reflect the scars from 100 years earlier. The Canadian ambassador to Belgium, together side by side with the German ambassador to Belgium, laid a wreath at the foot of the Brooding Soldier monument on the 100th Anniversary. It was a fitting union of remembrance and forgiveness. The children sang songs of forgiveness, but nothing tells the story like the tens of thousands of graves and a few massive memorials in the Ypres salient marking the final resting places of a generation efficiently mowed down by industrialized warfare. The Canadian ‘Brooding Soldier’ memorial was unveiled in 1923 to commemorate the Second Battle of Ypres. On April 24th 1915 the Canadians would soon have their turn to experience the full-on effects of chlorine gas. The gas was indiscriminate. It routed out mice and rats and rabbits from their homes in the ground and it strangled sheep and cattle. The gas also kills people. Our troops suffered the full effects of the chlorine gas, just as the French had two days previous. We were better prepared and managed to hold some of the challenged ground and many still hold that very ground. They are included on the lists of the missing and are more than likely in the ground in the area. For a week previous in 1915, the Canadian 2nd and 3rd brigades had been occupying the front lines of the already infamous Ypres salient. They were tucked between the French on the left and the British on the right. Our 1st Brigade under then Brigadier General Malcolm S. Mercer (of The Queen’s Own Rifles of Canada) was held in reserve near Vlamertinghe. Finally after the Division was subjected to six months of awful weather, it was spring. It was a nice day. Early on April 22nd it was becoming evident a German attack was imminent. The reserve brigade was put on short-notice-to-move a number of times. As pressure mounted throughout the day and that evening on our two brigades in the front line it became necessary to push the 1st brigade forward into the evolving battle. The battalions of the 1st brigade (1st, 2nd, 3rd and 4th) were sent forward in pairs. The 1st and the 4th engaged in a heroic action up Mauser Ridge to establish some kind of viable flank to protect against the rapidly advancing Germans. The French army had all but ceased to be an effective force due to the initial gas attack and the Canadians had to re-establish some semblance of a protracted defensive line. The 2nd and 3rd battalions crossed the Yser canal at pontoon bridge number 4, in the dark moving past Essex Farm where John McCrea’s medical teams were at the ready. They marched cross country past the ongoing flanking attacks of Geddes detachment and the 1st and 4th. As the 3rd advanced towards Mousetrap Farm which was the 3rd Brigade HQ, they suffered their first casualties from German artillery fire. Those who were killed were immediately buried and those wounded were the first guests of the newly established forward medical aide stations, manned by stretchers bearers, medics and battalion Medical Officers. As the 3rd awaited orders, 400 yards away the 10th and 16th Battalions were ordered forward into the legendary attack of Kitchener’s Wood just before midnight. The battalions formed up in line by company and advanced in the dark towards the woods, using the North Star as navigation reference. They chased the Germans out at bayonet point and recaptured the guns lost by an London Artillery unit days earlier. The 10th and 16th ceased to be effective fighting forces due to the number of casualties they sustained, yet more was expected of them over the next few hours. C and D companies of the 3rd Battalion under QOR Major Kirkpatrick were ordered to plug a gap in the line between Kitchener’s Wood and St Julien. These men formed up in line by company, and advanced cross-country in short rushes. They came under fire and fought a pitched battle from farm house to farm house. Our men dug in under fire and under cover of darkness. Many officers and men had been killed. From first hand accounts, the officers led from the front and their men bravely followed. In the morning of the 24th it was the Canadians turn to suffer a gas attack. Artillery fire preceded the gas and followed-on after the gas, as did masses of advancing German soldiers. The Germans were flanking the Canadians so the order to retire was given. The men of C and D companies had nowhere to go. Their comrades from A and B companies, just 500 yards away heard the withering fire as they ran out of ammunition and were silenced. Six wounded men had escaped from the two forward companies. The rest were killed, wounded or taken prisoner. The Ross rifles our men were using weren’t up to the task of such a fight. Upper Canada College First World War prisoners of war including 3rd Battalion’s Major Kirkpatrick. On our right an equally dramatic and heroic battle was taking place with the 13th and 15th battalions. A Victoria Cross was won that day by Corporal Fred Fisher of the 13th. Both battalions faced the gas attack, full on. For the historians in the crowd we think deeply about the exploits of this one battle and the losses of so many brave souls. It doesn’t seem to make sense now and it was on an unfathomable scale, but our thoughts return to the Belgian school children finishing songs of peace and forgiveness. I stood today for my grandfather Thomas Cully service number 10014 of D Coy. I remember all his pals and their families from the 3rd on the solemn and historical day. I shared the day at this place with a few new and old friends, many of whom were here for the same reason as I. I was here to feel, to remember, to be sad, to look for meaning and to thank goodness for all that we have as Canadians. Sadly there remain 4 years of such commemorations. We will tire of hearing about WW1 soon enough, yet imagine how tired a generation became of fighting it 100 years ago. Private Harold Reginald Peat (3rd Battalion), Lieutenant Colonel Pete Anderson, DSO (3rd Battalion) and Sergeant Arthur Gibbons (1st Battalion) each wrote and published first hand accounts of this battle. They are well worth a read. Peat’s “Private Peat“*, Anderson’s “I, That’s Me” and Gibbons’ “A Guest of the Kaiser” are available online at no cost. The Royal Canadian Military Institute’s museum collection was started in 1890 and it now holds many significant items. For example there is the Colt pistol used by Captain Charles Rutherford, V.C., to capture 80 Germans and 2 machine gun posts, for which he won the Victoria Cross in August 1918. Rutherford was born on a farm in Colborne Ontario on 9 January 1892. He joined The Queen’s Own Rifles in 1916, transferred to the 5th Canadian Mounted Rifles and went off to war. At 26 years of age, Rutherford was in command of an assault party during the 4th Battle of the Scarpe near Monchy, France on 26 August 1918. He found himself a considerable distance ahead of his men when he confronted a strong enemy party. With a masterful bluff, while brandishing his revolver, he took 45, prisoners including two officers and three machine-guns. The lieutenant then observed gunfire from another pillbox that was holding up the assault, so he attacked with his troops, capturing another 35 prisoners and their guns. The last sentence of his VC citation reads, “The bold and gallant action of this officer contributed very materially to the capture of the main objective and was a wonderful inspiration to all ranks in pressing home the attack on a very strong position”. On 11 June 1989, C.S. Rutherford was the last winner of the Victoria Cross from World War I to die. He was 97 years of age and is buried at in Union Cemetery, Colborne, Ontario. His story is one to be remembered as his combat revolver goes on display once again. St. Andrew’s Church on Saturday, October 4 at 7:30 p.m.
Foreign correspondent Brian Stewart, classical music expert Rick Phillips and friends will be featured in an evening of talks, dramatic readings, music and a visual show about the First World War and our community. Voices of War: Dreams of Peace: The Legacy of the First World War will recall an important period in our history – from 1914 “Toronto the Good” to the wartime stories of St. Andrew’s fallen soldiers and their families – and examine the legacy of “the war to end all wars” for 2014. Period music including It’s a Long Way to Tipperary, Keep the Home Fires Burning, and Nimrod from Elgar’s Enigma Variations will be performed on the church’s splendid Bösendorfer Imperial grand piano and Karl Wilhelm organ. Tickets are $20 for adults and $10 for students. Advance tickets are available atwww.standrewstoronto.org or at the door (cash or credit card). For more info, call (416)-593-5600, ext 231. St. Andrew’s Church is on King St.W. at Simcoe St., opposite Roy Thomson Hall. Nearest TTC Station: St. Andrew. Wheelchair Accessible. The event will be held at Moss Park Armoury, 130 Queen Street East, Toronto, M5A 1R9 from 9 a.m. – 5 p.m. Seating is limited to 100 attendees so make sure you register early! The cost is $65 which includes lunch. There will also be book signings, dealers, and artifacts. 1. What are my transport/parking options getting to the event? Yes you can transfer your ticket online up to to another person (see updating your registration info below) by the end of day on September 25th. You can update the information on your order (like name, email address, or answers to the organizer’s questions) from Current Orders under My Tickets. Please print and bring your ticket to the event. If you do not have your ticket you will be required to provide identification that will support your registration information. On this the 100th Anniversary of Canada going to war in 1914, we wanted to share some milestones with you. We’re very excited that late last night we surpassed 100,000 views on our website since we launched in February 2012! About three-quarters of those views were from visitors in Canada however the remaining 25% were from 134 countries. We started small but since then we’ve made 119 posts, have 249 static pages and have uploaded 1,025 images. Fittingly some of the most viewed pages on our site our the transcriptions of the war diaries of the 3rd Battalion, Canadian Expeditionary Force which were completed as part of a crowdsourcing project in the Fall of 2012. We’ve continued to add material relating to the First World War including nominal rolls, letters from soldiers, personal diaries and profiles on a number of QOR that served. We’ve recently put links to all this material on our WWI Resources Page to make it easier for visitors to find – please take a look! Of course this isn’t the end – we’ll continue to post information and resources particularly related to the First World War over the coming years and months. Thank you for being on this journey with us! On behalf of Blake Goldring, Founder and Chair of Canada Company, you are invited to a special evening to commemorate the 100th Anniversary of the beginning of the First World War. Join the Bill Graham Centre for Contemporary International History, the Munk School of Global Affairs and the Canadian Armed Forces on the evening of July 31 at Varsity Stadium for this commemorative event. Host: former war-correspondent, Gemini-winner Brian Stewart, Remarks by noted historian Margaret MacMillan and the CDS, Gen Thomas J. Lawson, CMM, CD. Vocal performances by Ruth Ann Onley, Danielle Bourre, and Jean Miso with the Canadian Children’s Opera Chorus. Event is free but tickets required; for reservations and further info click here. Perhaps not surprisingly, as the centenary of the First World War approaches, some of the most popular pages on our website are the transcribed war diaries of the 3rd Battalion, Canadian Expeditionary Force. Libraries and Archives Canada had scanned several hundred pages of these diaries and posted them on to their website as jpeg photos. As valuable as this was, they were impossible to search and the way they were listed on their site made it a challenge to find a particular date quickly. So in the Fall of 2012, we undertook to crowd-source the transcriptions of these pages and were very pleasantly surprised by the results! Within just eleven weeks, 27 volunteers all recruited online and some from the far corners of the world, had transcribed 53 months of diaries and they were posted on our website! This has also allowed us to link to other information on our website such as specific soldier profiles and to include photos of relevant artifacts. We continue to add to these pages as we can. I highly encourage you to check them out if you have not already done so because they give, in concise military way, a chilling perspective on this horrible war. We’ve received some positive feedback on this resource but I was particularly pleased to see the recent comment reprinted below, from a US Army Lieutenant Colonel whose Scottish grandfather crossed the border from US to join the 255th Battalion, CEF. He eventually see combat with the 3rd Battalion. His story also illustrates how the war continued to impact families long after it had ended. Thanks for transcribing the 3rd Bn war diaries. In August 1913, my grandfather, John Denning Wallace, immigrated from Paisley, Scotland to Kearny, New Jersey. In April 1918, he crossed the border and joined the Toronto Regiment to fight with the CEF in WWI. He served with the 3rd Bn on the front lines near Arras, France, from November 1917 until July 15, 1918, when he sustained a gunshot wound in the left arm. In February 1919, he was medically discharged for the “GSW left arm” and for “trench exposure.” A few years later, he died from the trench exposure at age 30 . On review of my grandfather’s CEF discharge certificate and military records, they did not reveal how he sustained his combat wound, and for many years I often wondered. Thankfully, the 3rd Bn war diaries provided me with some background. The 3rd Bn war diaries for July 14-16 1918, and the 3rd Bn end of month casualty report for July 1918, reveal that my grandfather, “Wallace, J.D.”, and three other 3rd Bn soldiers were wounded by machine gun fire whilst “laying wire ” near Post 7 in the Fampough sector near Arras. The next day, one had died from his wounds. Eric teaches at Northmount School in Toronto. He is currently working on the military history of the University of Toronto, focusing mainly on the university’s contingent of the Canadian Officers’ Training Corps. He is also serving on our Museum’s First World War Advisory Team. This paper begins with a flight of fancy meant to put its subject in a novel perspective. Imagine archaeologists at some distant time in the future coming upon the British memorials and war cemeteries clustered along the old Western Front. Suppose, too, that although the written sources for the Great War no longer survive, the mandate of the War Graves Commission to maintain the monuments in perpetuity has ensured a good state of preservation. In the same way that archaeologists test the historicity of the Trojan War against the evidence from Bronze Age sites, or reconstruct the workings of the Roman army from its camps and fortifications, our imagined archaeologists would set about collating and interpreting the details in the commemorative monuments to form a reasonably coherent picture of the Great War. They would infer from the sheer density of the war cemeteries that it had been a very static conflict; from the dates, regiments, and nationalities incised on the headstones they could establish a chronology of events and a latter-day “Catalogue of Ships” listing the peoples drawn from all over the world into the British Empire’s order of battle. The number of nameless graves, tallying with the registers inscribed on the memorials to the missing, would induce recognition of a frighteningly destructive war that inflicted not only mass death but mass annihilation. Some explanation for this would emerge from the insignia on the headstones identifying artillerymen, machine gunners, tank crewmen, and fliers, which bear witness to the advances in military technology that made such a rigidly concentrated war so consumptive of human life. An archaeologist sensitive to the contradictory logic of human affairs might perceive the trap into which the belligerents worked themselves, that victory alone, at any price, could redeem the sacrifice that mounted with each year of the war. The taut, pointed simplicity of these examples proves yet again that economy of words makes for much greater impact than does prolixity, something that Rudyard Kipling and Frederic Kenyon well understood when they made their recommendations on personal inscriptions. The infrequent but telling departures from the norm also bring out another point deserving of emphasis. Whatever control the Commission exercised over the personal inscriptions should be construed not as censorship but as a safeguard of propriety and dignity in the war cemeteries. The restrictions on length, and the small fee charged for an inscription, were deterrents against “the effusion of the mortuary mason, the sentimental versifier, or the crank,” and are consistent with the opposition to inappropriate epitaphs that the proponents of the cemetery reform movement of the nineteenth century had long made part of their programme. They took the view that irreverent or semi-literate inscriptions undermined the moral benefits to persons visiting cemeteries to reflect on the vicissitudes of this life and the promise of the one to come. As this view took hold, collections of epitaphs judged suitable for sepulchral inscriptions proliferated throughout the second half of the 19th century. The trend in civil cemeteries towards the spiritual edification of visitors was even more pronounced in the military burial grounds, in which the common aim of the architects and horticulturalists was to create the tranquil, contemplative atmosphere of an English garden, a setting designed to inspire reflection and meditation on the sacrifice of the fallen. We must also take into account the emotional restraint bred into a generation of parents born in the 1850s and 1860s commemorating sons born in the 1880s and 1890s – in other words, people deeply rooted in the Victorian Age – which surfaces in this epitaph, “Sadly missed, silently mourned by his wife and children,”15 and many more referring to private sorrows, silent thoughts, or hidden tears – faultlessly Victorian in concealing the intensity of the grief behind the stoic façade presented to the world. “For God and right. Let not a whisper fall that our hero died in vain.”  Confronted by a death toll so terrible and benumbing, those left to cope with their grief were understandably inclined to embrace the idealism or religious faith that made the sacrifice meaningful and necessary. These were not the only barriers against the unwelcome – and unbearable – feeling of despair or futility at so great a loss of life. “I will give him a white stone and in the stone a new name – victory.”  Canadians could also take considerable pride in the exploits of their soldiers which in many cases tempered the grief of the mourners. The same impulse that led Canadians to name schools, streets, geographical features, and even their children, after famous battles is apparent in epitaphs proudly noting soldiers’ deaths in the feats of arms that made the reputation of the Canadian Corps: “Died of wounds received at Ypres”; “He fell at the Somme. It is immortal honour”; “Mort à Vimy à l’age de trente ans en combattant pour la grande cause”; “Killed near Passchendaele”; “Killed in action at Cambrai”; and one more that reflected the renown won by the Canadians in spearheading the war-winning offensive that began at Amiens on 8 August 1918 – “Tomorrow will be Canada’s day.”  Other epitaphs no less proudly record the soldier’s courage in the performance of his duties or the esteem in which his comrades held him: “Died for King and country while keeping line open under shell fire”; “Killed leading an attack at Regina Trench”; “Mentioned in despatches for gallant and distinguished conduct;” “Beloved by officers and men”; “His captain said ‘No braver soldier ever led men into battle’”  – this last being one of several examples indicating that letters of condolence to next of kin inspired the inscription on a soldier’s grave. Just how protective Canadians were of the heroic and morally bracing legacy of the Canadian Corps can be seen on the headstone of a soldier killed in May 1917, five weeks after the United States entered the war. “I raised my boy to be a soldier” states the epitaph supplied by his mother. Her choice of words, baffling to our eyes, would have met with grim approval at the time. It is a Canadian retort to the popular American song, “I Didn’t Raise My Boy to be a Soldier,” which grated on Canadian nerves when the sanctimonious Yankees stayed out of a struggle that strained Canada to the limit, and again when the Doughboys began to claim all the credit for winning the war. The doyen of Canada’s military historians, Charles Stacey (1906-1989), recalled a joke passed around after the war which had the American general Pershing annoyed about the late arrival of his cab in Paris. “When it did arrive, Pershing protested to the driver, who was a female, ‘My good woman, you’re three minutes late.’ And the lady replied, ‘My good man, you’re three years late.’”  When borne in mind that the Dominion of Canada had lost a much greater proportion of her young manhood than had her far more populous, late-coming neighbour, both the levity and the epitaph make palpable Canadians’ resentment at the diminution of their efforts in the Great War, not simply for patriotic but for intensely personal reasons. The study of the personal inscriptions, as this paper has attempted to show, touches on subjects ranging from the broad to the particular, casting light on national, cultural, and social history, and, above all, on the myriad experiences and stories submerged within the vast depths of the Great War. “Be ashamed to die until you have gained some victory for humanity’; “Son of my heart, live for ever. There is no death for you and me”; “It is well done, Dad”  – ennobling, saddening, austere, rarely bitter, never cynical, the epitaphs cannot fail to touch the hearts of sympathetic readers; however, to return to the flight of archaeological fancy with which we opened, it has been the purpose of this paper to take the reader below the layer of emotion and expose the strata where further investigations must begin if the epitaphs are to enhance our understanding of the memory of the Great War. It is no great revelation to say that the epitaphs speak with the voice of a very different time, not of artists or writers, but of a populace in mourning. It warrants saying only to point us in the direction in which further research should proceed – back into the nineteenth century, not forward into the twentieth, led by Jay Winter and other scholars who have rightly insisted on the durability of the cultural traditions which sustained the generation faced with the mass death of the Great War, and would sustain a following generation faced with the mass evil of the Great War’s sequel. Only by excavating, so to speak, down to the foundation of the epitaphs, unearthing clues to the reasons behind their choice and setting them firmly in the cultural context of their time, can we hope to retain our ever attenuating link with a generation whose response to the tragedy of the war is so rich in historical and human interest. *From the inscription on the headstone of Lance Corporal Andrew Ramage, Princess Patricia’s Canadian Light Infantry (Wimereux Communal Cemetery). 1. The contrast between the attitudes of one time and those of another struck one historian at Tyne Cot War Cemetery as he compared the inscriptions on the headstones with the comments in the visitors’ book; see Paul Reed, “Vestiges of War: Passchendaele revisited,” in Peter H. Liddle, ed., Passchendaele in Perspective. The Third Battle of Ypres (London: Leo Cooper, 1997), pp.467-78, esp. 471-72. 2. Epitaphs of Private George Brignell, 54th Battalion Canadian Infantry [CI] (Cantimpré Canadian Cemetery); Private Albert Kick, 4th Battalion CI (Sancourt British Cemetery); Private Alec Feltham, 52nd Battalion CI (Nine Elms British Cemetery). 3. Best described by David Cannadine, “War and death, grief and mourning in modern Britain,” in Joachim Whaley, ed., Mirrors of Mortality: Studies in the Social History of Death (London: The Stanhope Press, 1981), pp.187-242, esp. 212-17. See also Jonathan Vance, “Remembering Armageddon,” in David Mackenzie, ed., Canada and the First World War: Essays in Honour of Robert Craig Brown (Toronto: University of Toronto Press, 2005), pp.409-33, and Alan R. Young, “We throw the torch’: Canadian Memorials of the Great War and the Mythology of Heroic Sacrifice,” Journal of Canadian Studies 24, no.4 (Winter 1989-90), pp.5-28. Commission (Reprinted Barnsley, South Yorkshire: Pen and Sword Books, 2003); Mark Quinlan, Remembrance (Hertford: Authors OnLine Ltd., 2005, pp.69-153). The cemeteries in which Canada’s Great War dead are interred are the subject of Norm Christie’s projected Sacred Places: Canadian Cemeteries of the Great War (Ottawa: CEF Books, 2011-). South Wales, Australia: Kangaroo Press, 1995); Trefor Jones, On Fame’s Eternal Camping Ground: A Study of First World War Epitaphs in the British Cemeteries of 11 the Western Front (Trowbridge, Wiltshire: Cromwell Press, Ltd., 2007). 6. The study of the epitaphs and the standard themes of consolation which have endured in western culture from Antiquity down to the present day begins with Richmond Lattimore, Themes in Greek and Latin Epitaphs (Urbana: University of Illinois Press, 1962), esp. pp.215-65, and Joshua Scodel, The English Poetic Epitaph: Commemoration and Conflict from Jonson to Wordsworth (Ithaca NY: Cornell University Press, 1991). 7. This cuts both ways, since scholars writing on the epitaphic tradition have not taken the personal inscriptions of the two world wars into consideration. They have no place, for example, in Karl Guthke’s otherwise valuable study, Epitaph Culture in the West: Variations on a Theme in Cultural History (Lewiston-Queenston-Lampeter: The Edwin Mellen Press, 2003), pp.325-58. 8. British, Canadian, Newfoundland, Australian, and South African epitaphs would come together within this corpus. The New Zealand government forbade personal inscriptions on the grounds that not all families would be able to afford the cost involved. Though one can appreciate the egalitarian spirit of this decision, it must be reckoned a great loss to posterity that the families of New Zealand soldiers – so highly regarded for their performance in both world wars – could not add their voice to the commemoration and popular memory of the Kiwis. 9. Jones estimates that about 45 percent of identified graves have an inscription, noting that the percentage on officers’ graves is much higher since their families could afford the fee charged by the Commission (which was eventually made voluntary, but too late for poorer families who had declined to submit an inscription). The issue of cost did not affect Canadian families since the Canadian government covered the cost of inscription s. See On Fame’s Eternal Camping Ground, pp.11-12; Longworth, The Unending Vigil, p.44. 11. Private Reuben haley, Duke of Wellington’s Regiment (Puchevillers British Cemetery); Private Thomas Quinlan, Royal Warwickshire Regiment (Rat ion Farm Cemet ery); Private William Rae, 20th Battalion Australian Infantry (Villers-Bretonneux Cemetery); Lieutenant Arthur Young, Royal Irish Fusiliers (Tyne Cot Cemetery); Sergeant William Clegg, Canadian Army Medical Corps (Bramshott Churchyard). 12. Private Albert Ingham, Manchester Regiment, (Bailleulmont Communal Cemetery); on his execution and his father’s insistence on having the details of his death inscribed on his headstone, see Cathryn Corns and John Hughes-Wilson, Blindfold and Alone: British Military Executions in the Great War (London: Cassell and Company, 2001), pp.256-60. 13. The recommendations on personal inscriptions were set out by Sir Frederic Kenyon, War Graves. How the Cemeteries Abroad Will Be Designed (London: His Majesty’s Stationery Office, 1918) (reprinted in Quinlan, Remembrance, pp.245-63 (the relevant passage on pp.251-52); Rudyard Kipling, The Graves of the Fallen (London: His Majesty’s Stationery Office, 1919), passim. See also Jones, On Fame’s Eternal Camping Ground, pp.8-14, and Laffin, We Will Remember Them, pp.24-27, with examples of the inscriptions suggested by the Commission. 14. See John Morley, Death, Heaven and the Victorians (London: Studio Vista, 1971), pp.42-44, 52-57; Guthke, Epitaph Culture in the West, pp.67-81; Karen Sanchez-Eppler, “Decomposing: Wordsworth’s poetry of epitaphs and English burial reform,” Nineteenth-Century Literature 42, no.4 (1988), pp.415-31. 15. Private Alfred Cogan, Canadian Army Medical Corps (Oxford Road Cemetery). 16. On the reading material in Ontario schools before and during the war, and the values it imparted, see the illuminating, well-judged new study by Susan Fisher, Boys and Girls in No Man’s Land: English-Canadian Children and the First World War (Toronto: University of Toronto Press, 2011), pp.15-27, 51-103. 17. Timothy Larsen, A People of One Book: The Bible and the Victorians (Oxford: Oxford University Press, 2011), pp.1-8, 295-98. Extension); Private James MacDonald, 1st Canadian Mounted Rifles (Menin Road South Military Cemetery); Driver Charles Maxted, Canadian Engineers (Lijssenthoek Military Cemetery); Private Alfred Blackmore, 46th Battalion CI (London Cemetery and Extension). 19. Michelle Fowler, “Faith, Hope and Love: The wartime motivation of Lance Corporal Frederick Spratlin, MM and Bar, 3rd Battalion, CEF,” Canadian Military History 15, no.1 (Winter 2006), pp.45- 50. Lance Corporal Spratlin died on 8 August 1918, and lies buried in Toronto (Demuin) Cemetery. Given the strength of his character and convictions, the inscription on his headstone, “I died that truth and honour might live,” is no empty sentiment. The evidence of the epitaphs also throws light on the religious beliefs of Great War soldiers studied by Richard Schweitzer, The Cross and the Trenches: Religious Faith and Doubt among British and American Great War Soldiers (Westport, CN and London: Praeger, 2003), pp.84- 117, 129-39; see also Duff Crerar, Padres in No Man’s Land: Canadian Chaplains and the Great War (Montreal-Kingston: McGill-Queen’s University Press, 1995), pp.161-65. 20. Private Arthur Jones, Royal Newfoundland Regiment (Knightsbridge Cemetery). 22. Private Vernon Earle, 27th Battalion CI (Lijssenthoek Military Cemetery). 23. Private Eugene Smith, 2nd Canadian Mounted Rifles (Bouchoir New British Cemetery); Private William Harpham, 50th Battalion CI (La Chaudière Military Cemetery). 24. Private Kenneth Neil MacDonald, 13th Battalion CI (Rue-Petillon Military Cemetery). 25. The interpretative approaches to the Song of Songs in Jewish and Christian exegesis are reviewed by Marvin H. Pope in The Anchor Bible: Song of Songs. A New Translation with Introduction and Commentary (Garden City, NY: Doubleday and Company, Inc., 1977). 26. Private Adon Smith, 87th Battalion CI (Adanac Military Cemetery); Private Emanuel Fulton, 31st Battalion CI (Passchendaele New British Cemetery). Wellesley Taylor, 14th Battalion CI (Chester Farm Cemetery). Private Harrison Allen, 16th Battalion CI (Villers Station Cemetery). 30. Private George Hargrave, 29th Battalion CI (Brussels Town Cemetery). 31. The ideological contest of the Great War, and the issues at stake in the minds of contemporaries, are well expounded by John Bourne, “The European and International consequences of the Armistice,” in Hugh Cecil and Peter Liddle, eds., At the Eleventh Hour. 12 Reflections, Hopes and Anxieties at the Closing of the Great War, 1918 (Barnsley, South Yorkshire: Pen and Sword Books, 1998), pp.315-326. The impetus given by American churches to the notion of a Crusade for a better world has been analysed by Richard M. Gamble, The War for Righteousness: Progressive Christianity, the Great War, and the Rise of the Messianic Nation (Wilmington, DE: ISI Books, 2003), pp.163-79, 209ff. Aldridge, 5th Battalion CI (Bully-Grenay Communal Cemetery, British Extension). 33. Company Sergeant-Major Arthur Dunlop, 2nd Canadian Mounted Rifles (Nine Elms British Cemetery); Captain Alexander MacGregor, 28th Battalion CI (Rosières Communal Cemetery and Extension); Private William Stanley Mills, 5th Canadian Mounted Rifles (Maple Copse Cemetery); Private William Sime, 29th Battalion CI (Adanac Military Cemetery). Thomas MacKinlay, 29th Battalion CI (Boulogne Eastern Cemetery). 35. Private Charles Everett Clark, 5th Battalion CI (Maroc British Cemetery); Lieutenant Guy Drummond, 13th Battalion CI (Tyne Cot Cemetery); Private Alexander McDonald, Canadian Machine Gun Corps (Bac-du-Sud British Cemetery). (Vancouver: UBC Press, 1997), pp.35-48. 37. Private Ernest McClelland, 1st Battalion CI (Chester Farm Cemetery). 38. Driver Alex Henderson, Canadian Field Artillery (Etaples Military Cemetery). 39. Lance Corporal Colin Broughton, 5th Battalion CI (Railway Dugouts Burial Ground); Private John Reid, 52nd Battalion CI (Nine Elms British Cemetery); Private Leslie Unthank, 18th Battalion CI (Ridge Wood Cemetery). 40. Corporal William Bowyer, 7th Battalion CI (Bailleul Communal Cemetery Extension), citing Joel 2: 25; Corporal Alfred Jones, 20th Battalion CI (Ridge Wood Cemetery); Sergeant David Hunter, 102nd Battalion CI (Givenchy Road Canadian Cemetery), citing 2 Timothy 2: 12. 41. Lieutenant William Clipperton, 8th Battalion CI (Lapugnoy Military Cemetery); Private Charles Ainslie, 8th Battalion CI (Brookwood Military Cemetery). 42. Lieutenant Lloyd Scott, 38th Battalion CI (Bourlon Wood Cemetery). 43. Private Hal Bowers, 47th Battalion CI (La Chaudière Military Cemetery). 44. Private Eusèbe Loiseau, 22nd (French Canadian) Battalion (Wimereux Communal Cemetery); Private James Stickels, Royal Canadian Regiment (Contay British Cemetery); Private Arthur Goyette, 22nd (French Canadian) Battalion (Bruay Communal Cemetery Extension); Private Edward Beldam, 2nd Canadian Mounted Rifles (Tyne Cot Cemetery); Private William Bartling, 52nd Battalion CI (Canada Cemetery); Lieutenant-Colonel Elmer Jones, DSO and Bar, 21st Battalion CI (Longeau British Cemetery). It is worth noting that references to the battles of the war set the corpus of Canadian epitaphs apart from British and Australian collections, in which one finds comparatively fewer specific mentions of the engagements where the soldier lost his life. Willoughby Chatterton, 3rd Battalion CI (Adanac Military Cemetery); Major Edward Norsworthy, 13th Battalion CI (Tyne Cot Cemetery); Corporal George Brown, Canadian Field Artillery (Brandhoek New Military Cemetery No. 3); Lieutenant Eric Lane, 85th Battalion CI (Vis-en-Artois British Cemetery). 46. Private Mostyn Scott Sands, 28th Battalion CI (La Targette Military Cemetery). 47. Vance, Death So Noble, pp.176-80; see also Paul Litt, “Canada Invaded! The Great War, Mass Culture, and Canadian Cultural Nationalism,” in Canada in the First World War, pp.323-49, esp. 333-40. 48. C.P. Stacey, Canada in the Age of Conflict: A History of Canadian External Policies. Vol.1: 1867-1921 (Toronto: University of Toronto Press, 1984), p.234. 49. 2nd Lieutenant Francis Lawledge, Royal Flying Corps (Bailleul Road East Cemetery); Private Harry Walker, 29th Battalion CI (Wulverghem-Lindenhoek Road Military Cemetery). 50. Private Llewellyn Jones, 1st Canadian Mounted Rifles (La Targette Military Cemetery); Lance Corporal Alexander MacDonald, 72nd Battalion CI (Nine Elms British Cemetery). 51. Private William Smith, 49th Battalion CI (Raillencourt Communal Cemetery Extension); Private Wilfrid Spicer, 2nd Canadian Mounted Rifles (Caix British Cemetery). 52. Private Reginald Box, 16th Battalion CI (Sancourt British Cemetery); Gunner Donald McKinnon, Canadian Field Artillery (Aubigny Communal Cemetery Extension). The line is taken from a poem by Helena Coleman (1860-1953), “Autumn, 1917,” which appeared in her Marching Men: War Verses, first published in 1917 and republished in 2008 by Dodo Press. The themes and diction of Canadian war verse would make for an interesting comparative study with the epitaphs; see Jonathan Vance, “Battle verse: Poetry and nationalism after Vimy Ridge,” in Geoffrey Hayes, Andrew Iarocci, and Mike Bechthold, eds., Vimy Ridge: A Canadian Reassessment (Waterloo, ON: Wilfrid Laurier University Press, 2007), pp.265-77. On the resurgence of interest in Canada’s war poets, see Joel Baetz, Canadian Poetry from World War I: An Anthology (Toronto: Oxford University Press, 2009). 53. Private Ayrton Wragge, 13th Battalion CI (Puchevillers British Cemetery); Lieutenant John Mewburn, 18th Battalion CI (Courcelette British Cemetery). 54. Private Edward Panabaker, PPCLI (Nine Elms British Cemetery). 55. Private Charles Turner, 10th Battalion CI (Lijssenthoek Military Cemetery); Private Arthur Hackney, 29th Battalion CI (Rosières Communal Cemetery Extension). 56. Lieutenant Joseph Hudon, 22nd (French Canadian) Battalion (Tranchée de Mecknes Cemetery); Captain Maurice Bauset, 22nd (French Canadian) Battalion (Sunken Road Cemetery, Contalmaison). On the 22nd Battalion as the standardbearer of French Canada’s martial reputation, see Jean-Pierre Gagnon, Le 22e bataillon (canadien-français) 1914-1919 (Ottawa et Québec: Les Presses de l’Université Laval, 1986), pp.301-307. 57. Private Lawrence Marten, 52nd Battalion CI (Wimereux Communal Cemetery); Private Magdal Hermanson, 8th Battalion CI (Wimereux Communal Cemetery). 58. Driver Leland Fernald, Canadian Field Artillery (Lijssenthoek Military Cemetery). 59. Lieutenant Phillip Comfort Starr, Royal Engineers (Bedford House Cemetery); Private Roy Marshall, Canadian Army Service Corps (Lapugnoy Military Cemetery). 62. Private Dominick Naplava, Canadian Pioneers (Tyne Cot Cemetery). 63. Private Chris Meti (Metič), Princess Patricia’s Canadian Light Infantry (Bois-Carré British Cemetery). 64. Lance Corporal George Edward Pike, Royal Newfoundland Regiment (Y Ravine Cemetery); Private Hal Sutton, 5th Battalion CI (Hinges Military Cemetery); Private Richard Boughton, 21st Battalion CI (Courcelette British Cemetery). Second World War dead is discussed in my book, Words of Valediction and Remembrance: Canadian Epitaphs of the Second World War (St. Catharines: Vanwell Publishing Ltd, 2008), pp.44-54, 57-91. Read more on The Telegraphy online. We’re looking for assistance in transcribing digitized copies of the 3rd Battalion, Canadian Expeditionary Forces War Diaries for posting on this site. The 3rd Battalion, known as the Toronto Regiment, is perpetuated jointly by the Queen’s Own Rifles of Canada and the Royal Regiment of Canada. Transcribing the diaries allows us to easily search them and link to specific names and events in the battalions history. Review the list of scanned pages on our 3rd Battalion War Diaries Transcription Project Page. Pages in italics indicate that someone has already committed to transcribe them. Pages that have been completed will be removed from the list. Note that the diaries up until April 30, 1915 have already been transcribed by the Canadian Great War Project and are in the process of being posted onto our site. It is not necessary for everyone to transcribe chronological order – if there is a time period you are interested in feel free to take that on – however to keep things simple, please complete the transcription for at least a complete month at one time. We DO want to transcribe all pages entitled WAR DIARY. For this stage of the project we DON’T need to transcribe all appendices. “Messages” generally should be transcribed – Operations Orders should not – however please reference untranscribed appendices so that we can provide links to them. It is NOT necessary to transcribe index pages – We’ll try to remove them from this list when we have time. Send an email to museum@qormuseum.org to tell us you are interested in participating. In your email indicated which months/year you will be working on so we update our list and avoid duplication of effort. Please send you transcription in text format (not tables). You use Word or simply paste them into the text of your email. See the format to be used in this example for November 11, 1918. Please make sure you review or better yet, have someone else review your transcription for accuracy. Typed entries are pretty easy to copy but transcribing handwriting entries can sometimes be tricky! You do not need to save up all your transcriptions and send in at once. If you finish a month, please send them to us. We’ll try to post as quickly as possible. If you have any questions, please email us at museum@qormuseum.org and we’ll do our best to respond as quickly as possible with the caveat that we too, are all volunteers! Thanks in advance for assisting us with this exciting project! !